The man who held the Major League saves record for 13 years finally got the call to Cooperstown. 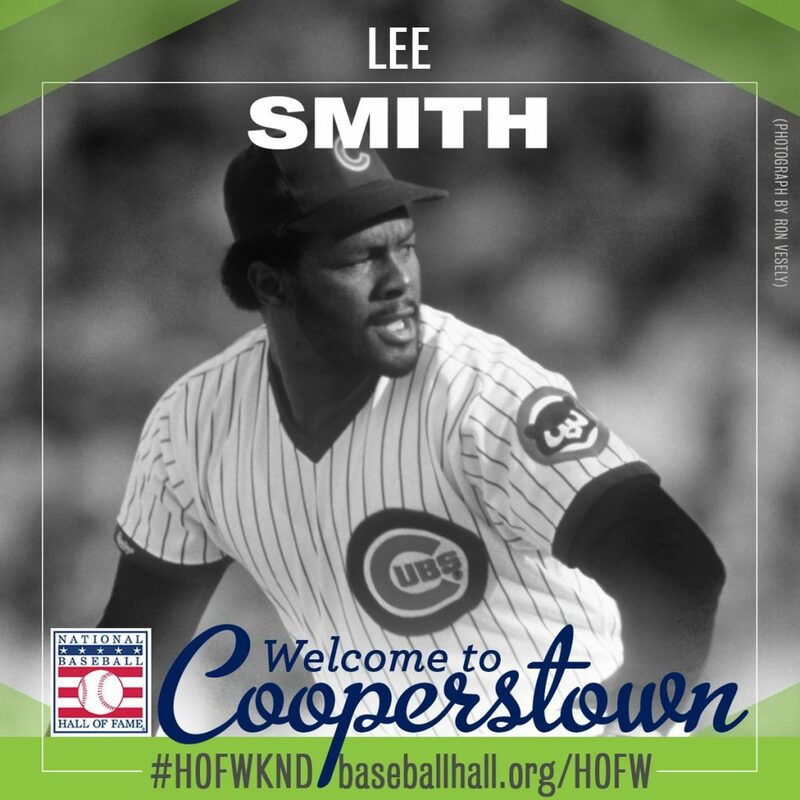 A seven-time All Star, Lee Smith led his league in saves on four occasions, and finished in the Top 5 of Cy Young voting three times. He also set the MLB record for games finished (802) and his 1,022 appearances were the third most in baseball history at the time he retired. Not a bad career for a guy that never dreamed of being a baseball player. Smith had a fascinating career, and I would highly recommend reading his full SABR bio, but I wanted to pull out a couple specific sections in case you don't have time to go through the whole thing. During his boyhood Lee endured experiences that shaped his view of the world. He awoke at 5:30 A.M. to catch a bus that passed three all-white schools on the way to his all-black school. After Louisiana integrated its schools in 1969, when he was 11, he crossed picket lines of protesting students and parents to arrive for class. The segregationist feeling died hard: Six times in his senior year at Castor High School, all-white schools forfeited basketball games rather than compete against a team with a black player. One day in his junior year of high school, as he walked across the outfield of a softball field during practice, a ball rolled to his feet, beyond the outfielders. Lee picked it up and heaved it to home plate. After the softball coach witnessed this, Smith was switched from the softball team to the baseball team. Even after being drafted in the second round of the 1975 MLB draft, it took some convincing (and some money) by Cubs scout Buck O'Neil to convince Smith to choose professional baseball. After being drafted, Smith sought out former major-league slugger Joe Adcock, who lived in nearby Coushatta, for advice. “Are you going to Northwestern to play basketball or get an education?” Adcock asked Smith. “An education,” Smith told him. Adcock’s advice: “Go (to Northwestern State) unless (the Cubs) offer you $50,000.” Smith was startled by the figure. But when O’Neil paid a visit to get his name on a contract, Smith asked for a $50,000 bonus and $8,000 for his education. To his surprise, O’Neil obliged. Smith regretted asking for so little, “I should have asked for $80,000!” he said later. A starter throughout his early Minor League career, when his control did not come around as hoped, Smith was moved to the pen while in AA. It was a move that did not sit well with Smith, and nearly prompted him to give up baseball once again. Smith resisted the move and briefly played basketball at Northwestern State. “Billy Williams (Cubs coach and Hall of Famer) came to my house. I can’t tell you in public what he said to me, but he convinced me to come back and play baseball,” Smith told a biographer. Smith returned to Midland as a reliever in 1979. (“The opportunity to pitch every day and be the ‘stopper’ became a thrill,” he said after a few years as a closer.) In 1980 Smith was promoted to Triple-A Wichita, and was among the league leaders in saves. For his efforts, he earned a September call-up to Chicago. And the rest is more well-known history, but again, I would encourage everyone to check out the full article. "There's a lot of great teams that I played for because Smitty's been around, but the Cubs gave me my first chance at the big leagues. And actually, the Cubs gave me a (2016) World Series ring, and that's unbelievable. "I always have really great ties with people I knew through that Cub organization a and other places, but I still have a great love for the Chicago Cubs. Now, I work for the San Francisco Giants, and I tell you what, a great organization, too. But wherever you start out first always has something in your heart that's always there." Considering he spent nearly three times as long with the Cubs organization than he did with any other it seems likely his wish will be granted. Former Cub & World Series Champion, Miguel Montero has announced he is retiring and transitioning to an agent. His other came during the 10th inning of Game 7 of the World Series... you know the game winning hit. Montero's RBI single extended the Cubs lead to 8-6. It would prove a critical insurance run as the Indians fought back in the bottom of the inning. Montero, who once negotiated his own contract with the Diamondbacks, is becoming a player agent. I'm glad for Smith and happy for Miggy. I know he left the Cubs under a cloud, but I hope he can come back and be recognized for all the contributions he made. I never understood the delay for Smith, since several other closers preceded him to the HOF. A selection well deserved! What a great story! Joe Adcock was one of my baseball heroes when I was a kid in Milwaukee watching the great World Series games--Braves and Yanks. Lee Smith used to drive me absolutely bonkers. It seemed like he always let the bases get loaded, or at least let men get on base, before slamming the door shut. But here's the thing: he would always slam the door shut! At least that's how I remember it. Still, I loved the big guy! Billy Hamilton is signing with KC. I would have liked to see him with the Cubs. He can't really get on base, but his speed and defense and arm make him valuable. He might have been interesting at half the price, but for 5M that is tough to pay a specialist on a contending team. A rebuilding team can give him ABs, maybe hope to "fix" him then turn around and deal him at the deadline. I think Zobrist had the game winning hit in game 7 not Miggy. Zobrist drove in Almora to make it 7-6. Miggy drove in Rizzo to make it 8-6, but then in the bottom of the 10th Cleveland scored 1 run so the final score was 8-7. So I don't know who actually drove in the GW run, but without Miggy's hit we still might be playing! My friend who is in the ATL front office told me this past weekend the Greinke to ATL rumors are real. There is on going dialogue to get a deal done. JA Happ is a potential fallback for them as well. I asked what is being said about the Cubs. The thought is the Cubs are in on Harper big time. But there is also some who say the Cubs may turn to the relievers and build a super pen and stick with their hitters. I asked what relievers and he said Britton, Miller, Allen, and Ottavino are the names they have heard. I asked if the Braves had interest or any talks about Heyward. He said no. Nothing more than a check in with the Cubs and doing due diligence with all GM’s. When does the first dominoe fall? I've read comments on other sites from 4 or 5 people who say their friend/relative is close with Harper and a deal with the White Sox is basically done. I love these kinds of rumors "I know this FO member," or "my kid's buddy is friends with...". I honestly can't get enough of them. I rather like this super pen idea. Harper is a great player and I'll be happy if he's a Cub. If he goes elsewhere oh well. Levine said that Ricketts will open his wallet for Theo. If so, Harper, an couple elite BP arms, a good/great defensive and contact bat SS, and the infamous leader is what I want. Move Javy to 2nd and figure out the outfield after signing Harper. 6/220 for Harper. Opt outs years 3 & 4. That's 36mil/year, plus he can sign 1 more big contract before retiring. Remember what happened with Jake last year? Boras / Jake ended up settling for $75M / 3 years after initially seeking a much longer contract. BTW, no word yet on whether Boras is offering a refund after Jake's underwhelming 2018 season. Perhaps a similar story unfolds with Harper this winter and he settles for your $220M / 6 years with an opt out every other Wednesday. If that is honestly Boras' starting point you have to give the credit... that is such and insane number I actually love it. Sign my guy till his 40th birthday... it will be so worth it!! I actually don't believe he's asking for that. There is no freaking way anyone would do that. The last few contracts that took hitters to 40 -- elite hitters like ARod and Pujols (better than Harper) -- turned out terribly! And as you said, the Arrieta flop last year had to sting. GMs just aren't doing the 10 year contracts anymore, 6 - 8 with huge AAV for a guy like Harper are reasonable. In 2012, Prince and his agent (three guesses?) somehow induced the Detroit Tigers to sign the 28 year old FA to a $214M / 9 year contract. I believe he made it through the second season before being permanently placed on the DL with a neck issue. I heard that the refund check is still lost in the mail. Something you've heard or you're suggestion? I like it. But I don't think Boras will. "Superstars get years" and all that. I do think the Cubs should go all in for Harper. There is no chance that they will extend Bryant so you have to think - for now - the odds of signing him as a FA are slim. So it would be good to have someone like Harper locked down for some years, an anchor with Javy to build around. "Lock him up"! "Lock him up"! Javy that Is. Cub fans are fortunate because they can sign Harper or not. Add a piece or two in the pen or not, add a middle infielder or not. Also, they can opt to come back with the same guys looking for more consistently and bonce back or healthy years from banged up and underperforming stars. Any of the above could be the smart moves and all options leave fans with some optimistic possibilities. Besides a backup SS and a couple BP arms and you are correct. Cubs could stand pat, but I doubt they will. I'm guessing 75% chance they make a medium splash. 25% for a big splash. Don't you think it "interesting" that the Baseball writers never came anywhere close to enshrining Lee Smith whereas the "Today's Game Era Committee" elected him unanimously in his first year of "eligibility"? (Close run-on sentence font). Which leads me back to my personal soap box that someone besides the "Baseball writers" should be voting for the HOF. Maybe 'Today's Game Era Committee' should toss a few out as well. Idk in a perfect world......etc. Some stuff is impossible to quantify. I had a buddy that lived in Maryland in the late '80's and we would go to ballgames. The year that they lost the first 21 games of the season (1988) we went to two games at Memorial Stadium. Really good hot dogs at Memorial Stadium... Big Red Hots. Baltimore only won 54 games that year and won both I attended. We were sitting in the front row next to the left field foul pole. Saw him drop the ball on the way down. Then we went to Philly. The Phillies were bad, lost 95 games. There were only 13K people in this big stadium. We gave the press box guy a note to give to Harry. Had our VCR set. In the 8th inning... we got announced on TV!!! My Mom's phone rang off the hook. I STILL HAVEN'T FORGOTTEN that the team I LOVE MORE than any other team combined (including Bears, Hawks and Bulls) won the World Series in 2016 and I am still elated about it. But the current and, even more so, future state of this team really concerns me. All rumors have the Cubs standing pat after a 2nd place finish and quick embarrassing exit in the Wild Card game. Yes some will point to the Cubs almost winning the division without Bryant being fully healthy as reason for hope and to stand pat. I point to the fact that while Bryant MAY be healthier than last year, there is no guarantee that he will be back to his MVP self. There are lots of concerns for this years team, which I will not go into detail but include lack of contact during at bats, high KO, poor situational hitting, etc. oh and then there's the age of the starters. More concerning is the future of this team. To say the Cubs farm system is lacking would be a gross understatement. I understand this is a direct result of winning so much in the past few years, but it should scare more people when you see there are very few, if any, high level MLB players in their system. Then if we assume that Theo leaves after his contract runs out, then there is a good chance the Cubs go back to the decades of losing. I would almost be okay with that if they put forth a genuine effort to win in the remaining window this team has (2-3 years?) But if they sit on what they have now, again a 2nd place finish and wild card exit, then this fan will be incredibly unhappy. I'm not so sure that the Cubs biggest need isn't something they can't control... better weather. John Smoltz mentioned it during the MLB Network NL Central Offseason Needs Show. As I said last year, the playoffs are VERY often played on cold inclement weather. If the Cubs need warm weather to win, they had better move to Miami or Phoenix. You missed the point. It was about all the rainouts which caused a schedule the likes of which had not been seen in quite a long time. The Cubs are not going to ever have decades of losing again. The Tribune is not going to buy the team from the Ricketts. IMO the winning will continue as long as the Ricketts own the team.